a pioneer in today's aviation industry. If our name sounds familiar, it is because our company has a long and varied history in the aircraft hangar and hangar door business. We are the original developer of the Electric Bi-Fold Door System and are known throughout the general aviation industry for our high-quality, state-of-the-art products and superior services. From our corporate headquarters in Harvard, Illinois, we design and fabricate general aviation facilities for the smallest single-engine aircraft to large corporate facilities for business jets. By the numbers alone, we have years experience in the business and an estimated 16,000 hangar units in operation in all 50 states and some Canadian provinces. Today, Erect-A-Tube enjoys a hard-won reputation as an industry innovator, always striving to develop better aircraft hangars and related door equipment. Were committed to our customers as well as the airport and aviation industry. 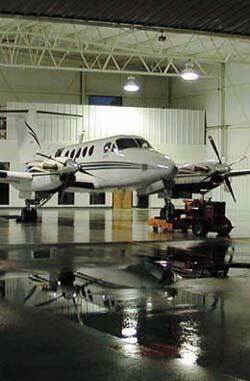 No other hangar manufacturer invests money back into the industry like we do. Half of our marketing dollars are spent supporting state aviation conferences, national and regional efforts of the American Association of Airport Executives (AAAE), Aircraft Owners and Pilots Association (AOPA), Experimental Aircraft Association (EAA) and FAA regional events. With Erect-A-Tube, Inc. as your single-source manufacturer for both hangars and hangar door systems, you can be confident that both will work together perfectly. So important is our customer service that we work hard at providing solutions with minimum turnaround time and handle complaints quickly, efficiently and to your satisfaction.